Are You Ready for Predictive Marketing? A few weeks back I blogged about the difference between predictive marketing and a predictive marketing organization. This was to spur marketers to think past predictive as a singular use case and to focus on building a systematic or solutions-oriented approach to marketing as a whole. Why the difference? From our conversations with customers and prospects we’re learning that predictive is all about driving towards the goal of revenue predictability. This differentiation is really just step one to maximizing the effectiveness predictive analytics within marketing and creating measurable results. 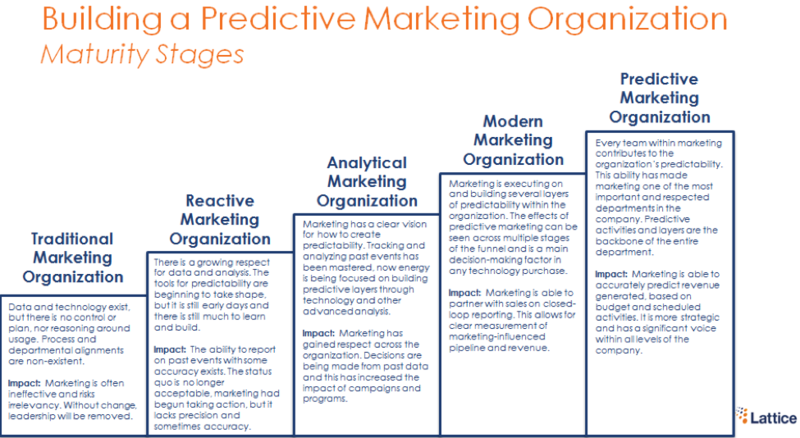 Today, I would like to introduce the five stages of Lattice’s predictive marketing maturity model, you can find each stage, its definition, impact and signs to help you gauge which stage you are in. This model is a precursor to a forthcoming report on building a predictive marketing organization so we want to know your feedback. Like it, hate it? Let us know in the comments. For this research we interviewed over 12 senior level marketing executives at B2B companies on what predictive marketing meant to them. The report will not only provide insight into the different stages of building a predictive marketing organization, but also actions to take to move all organizations through the stages. Be sure to subscribe to our blog to ensure you don’t miss the report! No matter your stage, start utilizing predictive NOW: Even if it is on a small scale predictive brings an opportunity to create competitive advantages. Honesty is the best policy: None of the companies that we spoke with were in the final stage and very few were truly modern marketing organizations. Every marketing organization has work to do – it’s best to realistically identify where you are today and figure out how to reach that next level. Think layers not point solutions: Marketing is built on different layers of technology, data and actions. Predictive needs to be a part of these layers – push yourself to create these layers and make sure to avoid silos. Description: Data and technology exist, but there is no control or plan, nor reasoning around usage. Process and departmental alignments are non-existent. Impact: Marketing is often ineffective and risks irrelevancy. Without change, leadership will be removed. You may be a traditional marketing organization if: Typically, there has been little incentive or desire for innovation within marketing. This could be due to multiple factors, but ultimately it has led to an outdated approach to marketing. Often these organizations lack advanced centers of excellence and approaches to data, technology and marketing processes. Almost always, marketing sits in a silo from the rest of the company and typically there are silos within the marketing department itself. Description: There is a growing respect for data and analysis. The tools for predictability are beginning to take shape, but it is still early days and there is still much to learn and build. Impact: The ability to report on past events with some accuracy exists. The status quo is no longer acceptable, marketing has begun taking action, but it lacks precision and sometimes accuracy. You may be a reactive marketing organization if: Change is occurring, often spurred by new marketing leadership or the understanding that marketing must deliver or risks irrelevancy. There is a rush to acquire new technologies, wrangle data, create processes and increase the marketing talent level. Often there is a lot to be done which at times can lead to turmoil and confusion. Progress is being made, but marketing is still reacting to the market, internal pressures and the need to reinvent itself. Description: Marketing has a clear vision for creating predictability. Tracking and analyzing past events have been mastered, now energy is being focused on building predictive layers through technology and other advanced analysis. Impact: Marketing has gained respect across the organization. Decisions are being made from past data and this has increased the impact of campaigns and programs. You may be an analytical marketing organization if: There is a strong respect for data and driving action from data. More advanced technologies and practices around data are present. However, this metamorphosis from traditional to analytical is still new and the best ways to utilize these tools and information has yet to be defined. The marketing organization is heavily focused on reporting on the past and understanding what has worked and what has not. There is momentum and an apparent path to move from focusing on past results to taking action to create future success. Description: Marketing is executing on and building several layers of predictability within the organization. The effects of predictive marketing can be seen across multiple stages of the funnel and is a main decision-making factor in any technology purchase. Impact: Marketing is able to partner with sales on closed-loop reporting. This allows for clear measurement of marketing-influenced pipeline and revenue. You may be a modern marketing organization if: As a well-respected and trusted organization, marketing is clearly delivering value to the company as a whole. Much of the work that has been put into data and technology allows the different departments to be iterative, creative and effective. Analysis is no longer just examining past results, but driving future actions and predicting what marketing actions will be most effective. Predictive analytics (technologies, models and analytics) are all a part of the marketing organization. There are still improvements needed in aligning all of marketing’s moving parts within the department and with other departments. Description: Every team within marketing contributes to the organization’s predictability. This ability has made marketing one of the most important and respected departments in the company. Predictive activities and layers are the backbone of the entire department. Impact: Marketing is able to accurately predict revenue generated, based on budget and scheduled activities. It is more strategic and has a significant voice within all levels of the company. You may be a predictive marketing organization if: This stage should be thought as aspirational as no marketing organizations have matured their approach around predictive this point/ However you will know you have reached this stage when marketing is one of the most respected departments in the entire company. The ability will exist to both predict from the bottom-up, what budget is needed and from the top-down, what marketing actions should be taken to hit revenue goals. Technology, data and processes will work in harmony allowing each department within marketing to take precise actions to accomplish their goals. Predictive analytics, technologies and models will be prevalent across the department and without them marketing would lose effectiveness. Marketing, sales, services and finance will work as one to drive predictable revenue to meet and beat goals.